Even what people say in an email or through instant messaging could potentially be copied and made public. In fact, if you’re beginning to feel like virtually anything that others do on the Internet could become part of your business’ online reputation, then you’re starting to get the picture. Now throw in the mobile internet and smart phones, where people can read and write reviews from anywhere. You can see how a bad review about your business will hit harder and spread faster than ever before. Many local businesses have found themselves in the unenviable position of being lied about, falsely accused, slandered, and attacked online. It’s a growing problem. The cost is immediate, staggering, and long term. 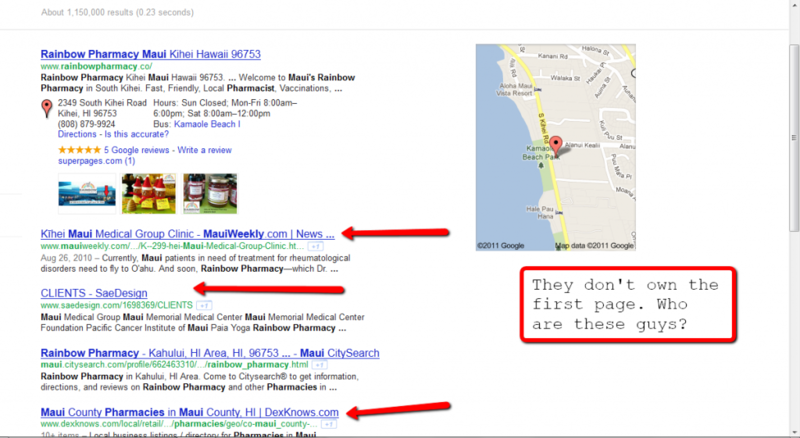 95% of internet users do not search past the first page of search engine results. 80% of the United States population researches a product on the internet before purchasing. Who would you start with in these results? The business with the most stars and reviews, of course! So, you can see how your business’ online reputation can directly impact your bottom line. Now the question is: How to grow, improve, and protect it. We’ve put together a list of the five most critical things every small business should be doing to protect their online reputation. When it comes to managing your business’ online reputation, you must be proactive. Think of it like a football game, it’s better to be on offense. You want to be in control of your own results. 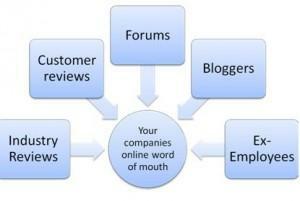 The first step is to find out what people are saying about your business online. The best way to do this is to simply Google your business name. Are there any reviews about your company on the first page? How many spots do your business own on the first page? Do you have positive content and reviews past the first page? If so, moving these items to the first page of Google would help your online reputation. To get your positive content to the first page of Google, focus on search engine optimization (SEO) for these items. Good SEO strategies, by default, combat negative mentions. SEO typically takes at least three months before your business will see an impact, but the long-term value is unlike any other online marketing effort. Your goal is to own the first page of Google for your business name with all positive content. Remember, 95% of all searchers will never go past the first page. If you look at the search results below, you’ll see the Grand Wailea has positive content all over the first and second pages. What if there are negative reviews and comments on the first page? Be careful. How you respond to these negative items is critical to your business. The biggest thing you can be proactive about when it comes to your business’ online reputation is to actively seek reviews. The two biggest are Google and Yelp. Of course this site is all about the online business directory called Google Places. These listings are free and compiled by Google from various online directories like the online Yellow Pages. What makes this page even more important now is that Google recently stopped displaying reviews from other sites, like Yelp. They now only display Google reviews on your place page. The best way to get reviews is simply to ask. Seek out your most loyal customers and ask them to leave a review on Google or Yelp. You could also offer some sort of incentive, such as 10% off their next visit or purchase if they leave a review. Another great way to get reviews is to keep a small video camera or just use your smart phone to record video reviews. Then, just upload them to YouTube. Do a little SEO on these videos and they’ll show up on the first page of Google. This is a very effective tactic for generating more leads and sales for your business. Many sites such as Yelp let the business owner respond to the reviews. The longer you wait to respond, the more potential customers see the negative review and believe it’s a true representation of your business. But first, is the Criticism Legitimate or Fake? Unfortunately, there is a small subset of people online who think it’s fun to leave bad reviews about businesses. If you find this to be the case, resist the urge to respond in anger. Instead, demonstrating concern and wanting to discuss the specifics of their encounter will go a long way towards showing other potential customers that you are interested in their feedback and want to improve the situation. Empathy is a powerful tool, and being sincerely concerned with their bad experience is a trait that every business owner should have. In the case where you’re dealing with someone who simply wants to hurt you, be very selective with your response. If the insult is small, a simple apology will do. As the insults escalate, you must be careful with your reply. If the complaint was legitimate, they may contact you. If they are simply being obnoxious, you will likely never hear from them, but at least you were professional in your reply and those who read the review will hopefully see that you were trying to be helpful and address the situation directly. Under no circumstances write fake reviews or ask your family, or worse, employees to write reviews for you. These tactics are almost always found out and will do your online reputation more harm than good. Social Media is all the rage these days. Facebook and Twitter have given anyone a voice to express their opinion. How can local businesses take advantage of this new technology to generate more business and help their online reputation? Participate in social media. Check you Facebook business page daily and update content regularly. Actively seek out local followers for your Twitter and Facebook accounts. Most importantly, when you’re commenting on these sites, be yourself. Let your customers know you’re a real person and truly interested in helping them to have a great experience with your business. Sticking to our number one tenant of being proactive in managing our business’ online reputation, we can’t just wait for others to post positive things about our business. We have to go on offense. Here are some of the best ways to do that. Writing compelling press releases and distributing them across the internet is a great way to get positive content out there. Google thinks highly of most of these sites and will more than likely show the press release in its search results. Creating positive articles and distributing them across various directories or getting them posted on blogs relevant to your business is another great way to get positive content out about your business. Did you know YouTube is the second largest search engine in the world? Creating either informative or funny videos about your business on YouTube can generate great press and if one goes viral, it could put your local business on the map. Also, Google owns YouTube, so they like showing videos in their search results. Creating a blog or other websites about your business is another great way to own more of that first page of Google. Sites like Tumblr, WordPress.com and others allow you to create blogs on their sites. Make sure you read the terms of service on these sites, some of them don’t like anything that looks commercial. Thank you for taking the time to read through this report. I’d love to have a chance to talk with you for even just 10 minutes about how our online reputation management services can protect your business and improve your results. It’s possible that by making a few small changes, you could see huge results.